The briefest month of the year wraps up today, yet there wasn't too much about this February that felt short to me. There were some lovely days for sure (such as Valentine's on which Tony gave me an adorable light pink Hello Kitty cupid plush, a darling card featuring two kisses bulldog puppies, and a gorgeous purple rose), but most followed in the same vein as January. Then, as the month drew to a close, the inevitable happened, I came down with a nasty flu that Tony brought home last week. At first I thought maybe, just maybe, I'd bypassed contracting it, but when I woke up on Tuesday morning this week, I knew that such luck was not on my side. Yesterday was especially unpleasant, as I duked it out with a 104F fever for most of the day (which, thankfully broke late in the evening). I don't tend to get over the flu very quickly, so I'll likely be a somewhat out of commission due to it for the next little while. Thankfully though, this was the first time either of us got the flu this winter, and we've been spared (knock wood) any colds this season. If I must get it, I'll take the flu at this late stage in the winter over getting it, say, during the Christmas holidays any year! Also on the health front, and I will be posting more about this matter when the date draws nearer, I wanted to give you all a head's up that I'll be going in for surgery again in the not-too-distant future and that I'll need to take a small blogging break (likely about two weeks) while I recoup afterwards. Long time readers will recall that this isn't the first time I've had do just that before, but I've had a good surgery-free spell, going close to two years since the last one (which took place in the summer 2011). That's looking ahead a touch however, and this post (the second in the end-of-the-month review series that launched last month) is about recapping some of the things, and blog posts, that have transpired since the beginning of the month, so let's take at gander at such things first. As I wasn't feeling too swell throughout this whole month for various reasons, there weren't many outings, and I was grateful to have some vintage outfit photos taken in January to use throughout February, including a return to my beloved grey wall in Kelowna to shoot my 1940s Valentine's ensemble (a photo from which also appears below). I always like to keep a rosy outlook, no matter what life throws my way or how I'm feeling, so we kicked off February with a super fun look at the history of Groundhog Day on February 2nd, then a couple of days later, I shared my awesome new mini pink Christmas tree (which, it was unanimously decided, I should leave out year round and decorate for each of the various major holidays). In a rousing game of vintage blog tag, I shared 21 facts about myself pertaining to my passion for the past, personal style, and vintage filled life (I had such a blast writing this post!). A few days later, the sharing continued when - in a nod to Valentine's Day - I posted about Ten things that make my heart beat faster (amongst which one will find everything from fiddle music to the thought of wearing a genuine Dior New Look ensemble). The day after Valentine's, as per a request from a reader that came in a couple of months ago, I posted about something that has been incredibly near and dear to my heart for the better part of my life: writing poetry. In this post, I shared four of my own poems with you and touched on the profound importance poetry has had on me over the years. As we cruised our way through the second half of February, topics as diverse as the history of maple syrup to a celebration of Greek culture as seen in various mid-century sources (fashion very much included) appeared. Sandwiched in amongst those two posts, I also wrote more about my love of Freddies of Pinewood's wonderful vintage reproduction denim offerings. As well, later in the month we took a peak at Ten investment worthy vintage wardrobe items, any one of which I'd be pleased as punch to splurge on if circumstances permitted anytime. Then earlier this week, I was in the mood to discuss something pertaining to local history, so I shone the spotlight on Penticton born classic Hollywood actress Alexis Smith. And for the very last post of the month - save for this one, yesterday I blogged about a rare day of glorious winter sunshine and also chatted about one of my beloved vintage Austrian fruit brooches, complete with a bevy of photos taken on one of my favourite places in town, my parents' deck. There were other posts here as well in February, but these standout as some of my personal Favourites. Elsewhere online, I was touched as can be to mentioned in a number of wonderful places across the web this month. On the 7th I was absolutely honoured to included amongst the terrific blog Vintage Frill's list of their Top 10 Vintage Blogs (sharing this post with some seriously venerable company!). I was recently asked if I'd like to write about why I love Canada and what being a Canadian means to me for Vintage Lifestyle Magazine. I'm happy to announce that my little write-up on this subject appeared along side several other similar pieces from bloggers and other inspiring individuals around the world in the latest (free, online) issue of Vintage Lifestyle Magazine (you can see my piece on page 76). This is the second time I've been a part of this truly fantastic online fashion and vintage lifestyle magazine, and I want to thank the wonderful folks there again for including some of my thoughts on Canada in issue 14. 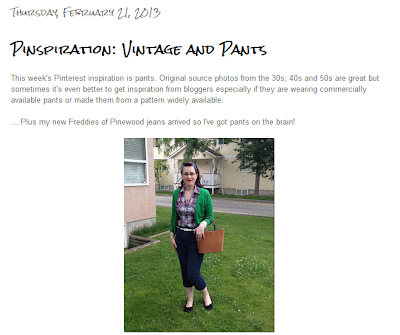 As well, just last week, the immensely lovely Stephanie of The Girl with the Star-Spangled included me in her great post about vintage blogging ladies sporting trousers in her great photo filled post Vintage and Pants. Gazing towards March on the blogging front, some of the topics that I'm planning to hopefully delve into here in the coming month include budget-friendly 1940s sewing patterns, a St. Patrick's Day meal, unexpected sources of vintage wardrobe inspiration, and an Easter related post or two. Here's to whatever March holds in store and the heartfelt hope that it will be a lovely, joyful month for all of us! Ohhhh, and last but not least, don't forget that March 10th marks the return of springtime daylight saving time (so remember to set your clocks ahead an hour, my sweet dears). Hope you and Tony feel better soon. Having everybody sick at the same time is the worst. I'm thinking good thoughts to help you recover from the flu and your upcoming surgery. I do hope that you return to good health quickly and that you have a speedy recovery after you upcoming surgery. May the Good Lord bless and keep you! I hope you get over the flu quickly and have a successful surgery! I'm looking forward to March! I hope you get back to feeling well very soon! Well wishes sent your way! I am sorry to hear you are not very well :( I do hope you get better soon- and that your next hospital stay will be a helpful one if nothing else! Please feel better soon, sweetie. Sorry to hear you've not been feeling well! And good luck with the surgery! I will be thinking of you. I'm still on tour. I'm currently in Brandon, MB for the weekend. ttyl! How much do I want a hat like that? Such a pretty colour on you. Touch wood, the last time I was poorly was about four years ago which boggles my mind as my immune system must be far better than I imagined! You had a great month! A month to remember. Kudos on your many achievements. But the last picture has me tantalized -- What is "the story behind Hedy Lamarr's baby"??? You're too kind, Ally, thank you very much. Not having a copy of this magazine to flip though, I'm not entirely sure what the story regarding Hedy's baby was. Ms. Lamarr was marred six times, gave birth to two kids and adopted a third, so I bet there were some intriguing stories that the press would have been all over about her life back in the day. Aww, I'm sorry you're sick, Jessica. I hope your recovery will be swifter than expected! I hope you and Tony feel better very soon! I'm glad your fever broke, 104 is very high. My goodness! I'll be praying for a quick recovery from your surgery. Take care sweetie! I very much admire your sunny attitude, Jessica, I really do. Also love your brogues in the above lovely photo! Thank you for all your kind Instagram likes recently, and I really hope you make a quick recovery from the flu. I hope you're felling better soon. Sending lots of well wishes and virtual hugs your way. I shall have a good look at your 10 favourite vintage bloggers. I paid 50 pence for the silver top and definitely I love it. So glad to keep in touch, Jessica. That is a killer deal for such an incredible shirt! I love that you're a bargain hunter like I am, too. 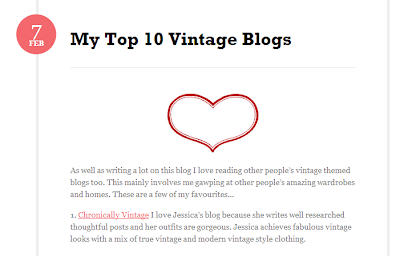 I didn't write the list of 10 favourite vintage bloggers, I was touched to be a part of one on the terrific site Vintage Frills. I think I'd have to make a list of 1000 vintage bloggers if I did - there are so many out there that I adore and am perpetually inspired by. Thank you very much, everyone, for your caring, lovely get well wishes. They truly mean a great deal to me. I'm still completely sick as the day is long with this flu (I think it's the second worst flu I've ever had), but luckily I wrote a post for this weekend earlier in the week (on Tuesday, as soon as I started to feel that I was falling ill), so there won't be dead air (so to speak) here today. I'm sending all good thoughts your way and hoping you will soon be well again. When the flu hits, it hits hard and I'm so sorry you both have had it. Hoping that your surgery goes well and that you heal quickly...take good care. Grey skies are gonna clear up! I hope you'll get well soon, dear. And I cross fingers for your succesful surgery. Take care about yourself! Thank you very much, dear Sanne. 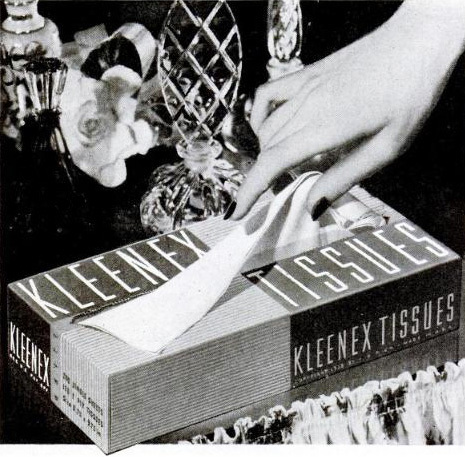 It's an unbridled joy to blog here and bring you all the vintage fillled posts that I do.